Tynecastle Under-13s were too much to handle for their out-of-town opponents as they overcame Carolside FC 7-0 in the fifth round of the Inspiresport Scottish Cup. The west coast side struggled to cope with the Tynecastle attack and just before the ten-minute mark, Luke Paxton scored the first of the day. He trapped the ball in the box, turned and hit a low drive into the back of the net. Soon after, Alex McNaughton whipped a ball into the box and Ryan Dixon bundled over the line to score his team’s second. Fraser Munro burst down the left wing and into the box, beating the keeper at the near post to take the score to 3-0 in the 20th minute. Cody Burrell added Tynecastle’s fourth before the break, curling in a free-kick from 20 yards out. Throughout the match Tynecastle were excellent at closing down their opponents. Carolside struggled to hold possession of the ball and link up passing play. Tynecastle started the second half much like they did the first. They were on the scoreboard again soon after the restart as James Lee drilled the ball across the six-yard box and Owen Melrose slid in to tuck away at the back post. Not long after, Melrose got his second of the game making it 6-0. Goalkeeper Calum Barlow was rarely called upon but when he was required he did well to stay alert and clear any danger. Midway through the second half, the referee awarded two penalties to Tynecastle for separate incidents but neither was converted. The first bounced off the crossbar and over and the second was saved brilliantly by the Carolside keeper, diving to his right. Just before the game ended, Blair Rennie fired high into the roof of the net. Elsewhere, Cramond Under-13s defeated Dunbar United Colts 2-1 in the Colin Campbell Sports Cup. The Edinburgh team started the match brightly and opened the scoring as Daniel Brown stroked home a great team goal, with six players involved in the build-up. Ruari Smith made it 2-0 in the 18th minute with a well-taken finish. Dunbar scored a late consolation goal to make for an exciting finale but the Crammond defence held firm. Goalkeeper Jack Rolland made a brilliant save just before the final whistle to ensure their progress to the next round. 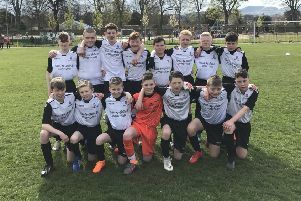 Beechwood Under-14s kept a clean sheet as they beat Leith Athletic in the David Innes Cup. Leith came close a number of times but Jonathan Green grabbed a goal in each half for Beechwood and David Methven scored the third from the penalty spot to round off a convincing 3-0 win. Peebles Under-14s won 4-0 against Kirkliston South Queensferry in the Paladin Cup. Both teams created chances as they were keen to move the ball about the pitch but Adam Black broke the deadlock scoring the only goal of the first half. In the second half, Peebles took control early on courtesy of two excellent strikes from Fraser Carlotti. Greg Zokas headed in late on from a corner to cap off their well-deserved victory.